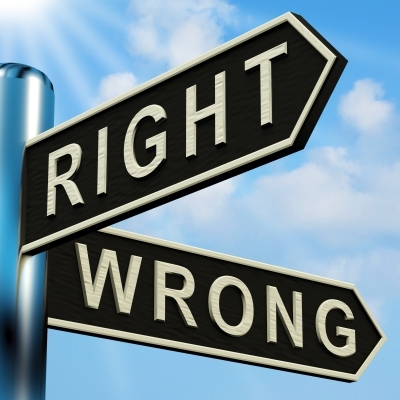 What Makes Someone RIGHT or WRONG For You? There’s nothing more disheartening than thinking you’ve met “the one” … your Mr. Right or Mrs. Right and they end up being all wrong. So were they always all wrong or did you ruin them … perhaps you were looking at them through rose colored glasses. This is something I kept wondering about until I read this great article called Looking for Mr. Right when all you see in Mr. Wrong. Talk about an aha moment!! It’s like they wrote it for me and my current challenges. We’re all looking for that special someone, perhaps some of you have found them … perhaps you THOUGHT you found them and you really didn’t. So, then, how do you know? Calling Mr. Right or Mrs. Right!! Hellooo anyone home? Sound familiar … I have to say YES!! This is definitely the cause of my recent heartache … MR. WRONG!!! Although I knew all this stuff, it makes it more real when you see it spelled out like that huh? Now perhaps not all of the above applies but if most of it does then you have to ask yourself if you’re wasting your time. I sure was! Best advice from the article? Do you always end up with Mr. or Mrs. Wrong? Have you found your Mr. or Mrs. Right? Are you Mr. or Mrs. Wrong? Would love to hear from you in the comments!! Great blog Suzie (and loving the Mary J quote btw). The fact is I always knew who my Ms.Right was but I was Mr. Wrong for many years. It took some growing up, but I do believe in some cases…all it takes for a Mr. Wrong to change is having some perspective and maturity. Thanks Jimmy! You just have to be ready and find the person who makes you want to be right. I dabble in the Mrs. Wrong box here and there too! I love that. 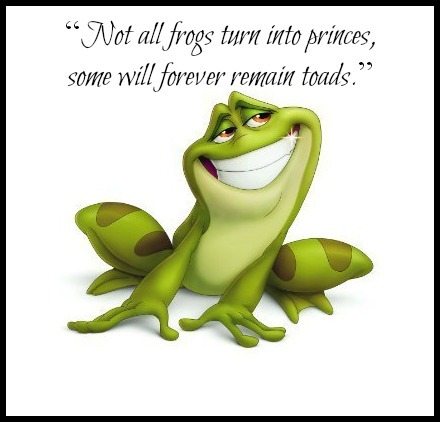 “… some are always toads.” It is so true! Thanks so much! Yes, regardless of how hard you try to believe in someone’s “rightness” some people just won’t change. Great post! I can totally relate! It actually made me sit back and think about the situation between Mr. Sports Fan and I. He’s Mr. Right in so many of those scenarios, but the very few that are “wrong” are wrong for both of us. Interesting! Thanks! It’s all about finding the balance you need to make it work … it seems you guys have it!! What a great post! How many women (and men) should print that list out and put it on their refrigerators?!!! Right? The problem is we are brought up to accept and allow differences in our friends and even family members… but when looking for the mate we will live and partner with, it requires an entirely different set of skills, and a completely different approach! We *can’t* be “accepting” and “tolerant” when it comes to intimacy. We are allowing this person into our innermost thoughts, feelings and body parts! WEEEE are the only ones who can raise the bar for ourselves… so let’s get to it shall we? Hold yourself to a higher standard when it comes to those you will date. And on another note, I agree with Jimmy – some guys may be right, but it has to be the right time and space in their lives as well. If I’d met my man ten or so years ago, it never would have worked. Of that I am convinced. Thanks Lisa Jey! You’re right … we do need to raise the bar and not tolerate less than we truly deserve and want at the this particular time in our lives and yes that could definitely change over time. I think everyone needs to just take a step back and stop looking. Spend time making yourself AWESOME and in NO NEED of a significant other. And I mean this REALLY… like get to where you believe it yourself! Then it becomes the truth: You aren’t NEEDY of someone in your life… if they add to your life significantly, and allow you to do the same, then ROCK ON BABY. AMEN SISTER!! You need to be complete and whole yourself before wanting anyone there. They should be an added benefit and not an added headache! Great post. Inconsistence really is the key and the aspect that will try one nuts. Thanks for the comment! I like those too … you’re right!! I dated guys who made me an option and took me a while to find someone who didn’t do that. Thanks for the comment!! We’ve all been there and we just need to stand up for ourselves and not settle for less! !